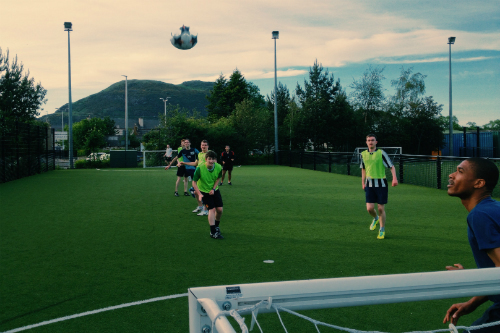 Rivalling Rio for a dramatic backdrop, Peffermill Playing Fields in the summer is a great place for football. Talking of the World Cup, if you want to be the loveable person pointing out the errors in various Brazil-related myths, Fernando Duarte is your man. Talking of the World Cup (for the last time this week), you may not have noticed that it kicked off the cyborg era but Ben Popper did. Fraser Nelson (with help from George Orwell) makes a case for how the Bible can help all of us speak and write better. As well as reading the Bible, Christians shouldn't be afraid of reading secular novels, as Amy Julia Becker and Russell Moore explain. My friend Michael Saner writes rather wonderfully on the lows and highs of a cycling saga. Finally, what would The Lord of The Rings look like if illustrated by a Russian medievalist? Pretty much like Sergey Yuhimov's.